SANTA CLARA, California (AP) — Denver linebacker Von Miller harassed Carolina quarterback Cam Newton from start to finish Sunday, forcing two fumbles, making 2-1/2 sacks and earning MVP honors in the Super Bowl. 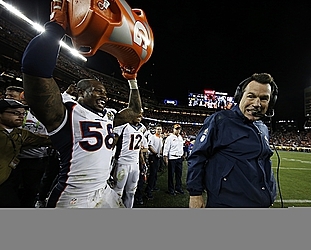 "I'm so proud of my guys," Miller said, clutching the silver Lombardi Trophy. "It's been every last one of you guys in the locker room that's gotten us to this moment right here." Miller created Denver's first touchdown by zooming past the right tackle and breaking in on Newton to rip the football away from the QB, who was honored as the regular-season MVP. The fumble bounced into the end zone, where defensive end Malik Jackson landed on it to put the Broncos up 10-0 about 8 1/2 minutes into the game. With 4 minutes remaining in the fourth quarter, Miller set up Denver's only offensive touchdown. Again, he got past the right tackle and reached out to grab Newton's right arm in the throwing motion to force a fumble. The ball was eventually recovered by safety T.J. Ward at the Carolina 4-yar line, and soon thereafter, C.J. Anderson's 2-yard run sealed the victory for Denver. And, showing his versatility, Miller even made plays in pass coverage, dropping back to force an incompletion from Newton to Jerricho Cotchery at one point. It was all part of quite a display by Miller and the rest of Denver's defense, making the NFC champion Panthers and their No. 1-ranked offense look poor. Thanks to Miller and Co., Peyton Manning did not need to do much with Denver's offense: The Broncos' 194 total yards were the fewest ever for a Super Bowl winner. Denver's defense wound up with a Super Bowl record-tying seven sacks, showing off the rush that led the NFL with 52 sacks this season. Two years ago Denver got walloped 43-8 in the Super Bowl by Seattle, owners of the league's best defense. General manager John Elway set out to build the Broncos' defense, adding players such as DeMarcus Ware, T.J. Ward and Aqib Talib. Now comes the offseason and contract negotiations for Miller, someone the Broncos would love to lock up for the long term.